The "cottage" concept in Senior Living envisions a stand-alone home with all the benefits of community living. The living environment is comfortable and familiar yet safe and secure enabling the resident to remain independent, stay active and retain a well-balanced social life. 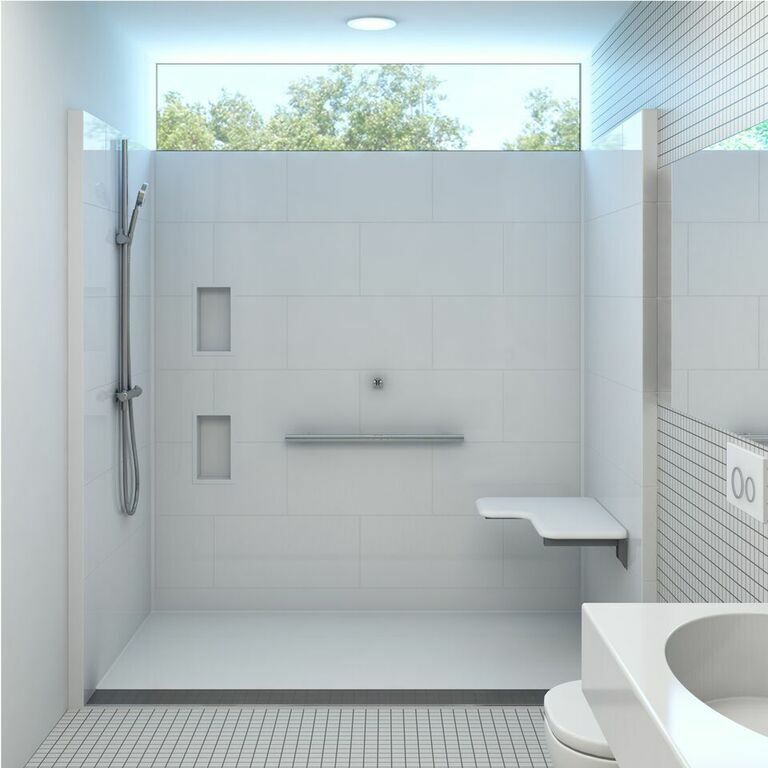 Comfort Design showers and tubs provide a home-like look and feel and are beautifully designed, all the while being comfortable, easy to use, and safe. 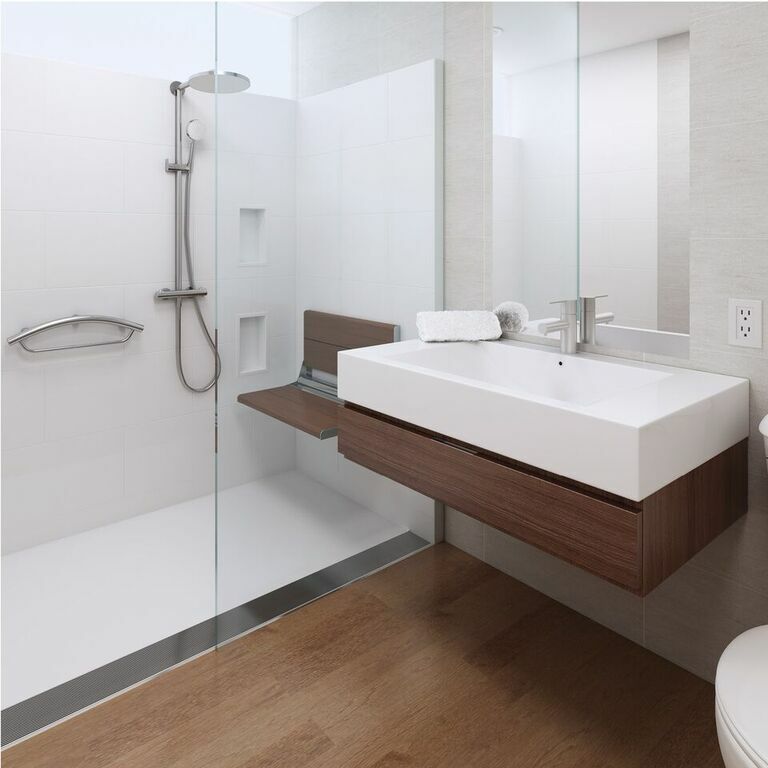 Personalize independent bathing in the "home" setting with Comfort Design bathing fixtures. Level entry showers are commonplace for cottage elite design today. The stainless trench grate cover is designed to bland with modern bathing room fixture finishes of all kinds. It is important that all accessories share a common bond of form and function. Cottage Elite deserves the very best and this fold up teak seat meets that need. The clean lines and natural wood tones make this seat a desired fixture and not an also-ran accessory. Combination towel rack grab bar systems are new and promote safety with convenience in the shower. The shower tower with combination hand held shower wand is placed strategically near the seat for the day the bather prefers to bath seated. With the seat folded up, there is ample room to shower conveniently in protected space. 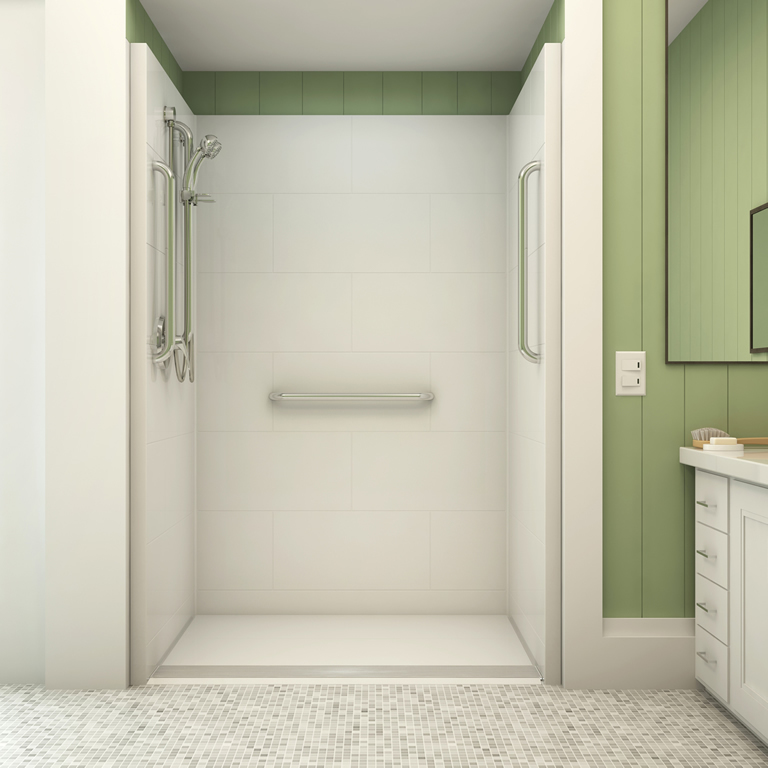 The clean lines of the subway tile design and simple grab bar system enhance the look of this accessible shower. The hand held shower wand has an attachment point on the back wall near the seat for access form the seated position. Some designers consider a second diverter valve at the seat location for better plumbing access. The level entry trench drain system promotes safe entry and exit from the shower. 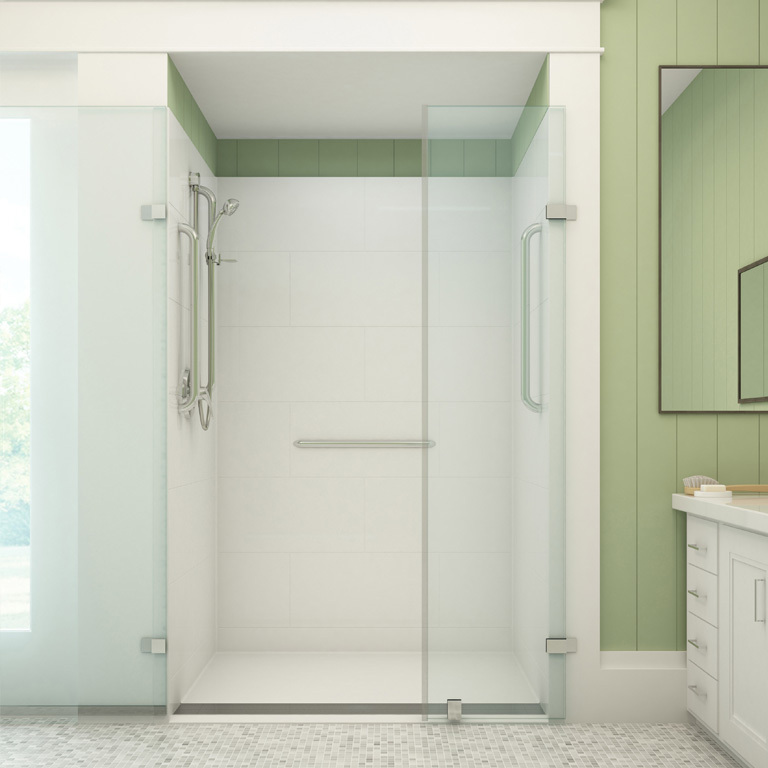 Modern heavy glass doors have hinges which allow 180% pivot which means showers can be adaptable to allow for assisted entry. The glass panel door is a necessary look in the cottage elite environment. This level entry shower with patent pending trench system promotes a safe shower environment environment. The two vertical entry bars are newly designed with both a smaller radius and no eschuscion limiting their profile which enhances the look. The hand held shower wand has been mounted on a combination grab bar/slide guide designed with the same minimalist features as the other grab bars.